Well tomorrow is the big day for the new Renault, but there are some peek shots already! The new car apparently features a full blown shark fin, contract to the other launch cars we have seen already. Nothing earth shattering about the design as far as those shots are concerned. Quite a high nose, possibly short like the TF109. Seems as if they integrated the exhausts just like McLaren. Nice stuff so far, glad to see a better-painted sharkfin too. That engine cover is on a stand, so we don't know if the exhausts will protrud through or not. Whoa, front suspension geometry is quite agressive! But look how heavily undercut the sidepods are. Interesting stuff. Also it has that high voltage sign on it. Hope they're going to test KERS for the first time. Still, it's better than most of the white based colour schemes. Renault seem to be pulling a McLaren and going the opicite way to Ferarri and Toyota with no Mirror Mount/Bardge Board on the side pod. And just as i thought, the Shark Fin would make apperances in the 2009 cars as the higher rear wing must be very suseptable to side ways movement/yaw, probably more than the 2008 cars. Difficult to make an idea from the pics.Looks like a combination between the F60 and TF109(sculpted sidepods and cutout exhaust outlets), no bold bodywork solutions IMO. 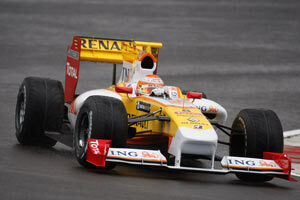 Also, with Renault in 2009 it's all about the engine anyway. Those sidepod air inlets look even smaller than the McLaren's, astonishing. For the paint they should move away from distinct sections and fade the colors into each other, white to yellow to orange to red, it would be much more interesting than current. ISLAMATRON wrote: Those sidepod air inlets look even smaller than the McLaren's, astonishing. Red is due to new sponsor Total. Racing cars are neither beautiful nor ugly, they are beautiful only when you win races.